The Kimberley region of Western Australia is larger than Victoria and Tasmania together, bigger than Germany, three times the size of the UK, or comparable to California. We have six towns here. Only three of them have a population over 2000. 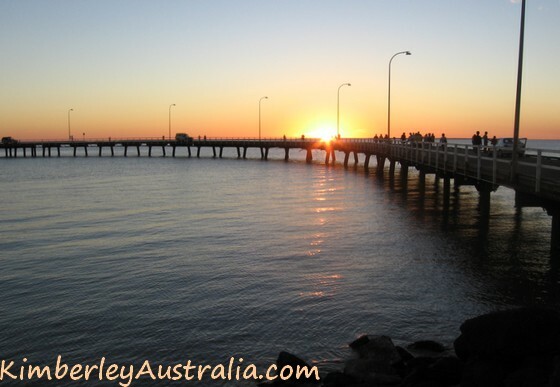 Broome (population around 14 000) is the biggest and most touristy of all Kimberley towns. It is marketed heavily as a tropical beach paradise. 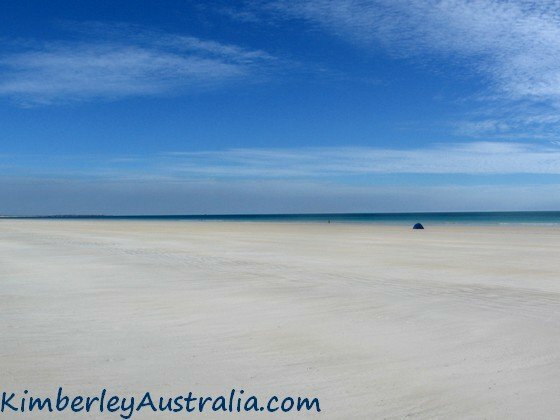 The beaches in and near Broome are world class, no doubt about it. But many people arrive here with wrong expectations. Broome itself is still a small place. There just isn't all that much there. At least not when you compare it to other popular beach destinations around Australia or the world. Derby (population 4500) is 220 km north of Broome, also on the west coast. But there aren't any beaches here, just crocodiles and mud crabs. The main reason that most tourists visit Derby is that it marks the beginning/end of the Gibb River Road. You can also join cruises or flights to the Horizontal Waterfalls and the Buccaneer Archipelago from here. Well worth it if you have the time. The fishing is good, the locals are friendly, and Derby offers a few distractions that make a short stay very enjoyable. The main reason for tourists to stop here is Fitzroy Crossing's vicinity to the Geikie Gorge, Tunnel Creek and Windjana Gorge National Parks. 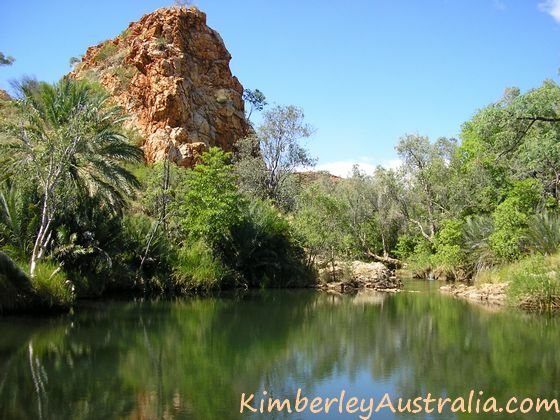 You can visit Tunnel Creek and Windjana Gorge on the way from Derby to Fitzroy Crossing. That first part of the Gibb River Road is very well maintained. Near Fitzroy Crossing you get back on the highway. Halls Creek is about the same size as Fitzroy Crossing. Personally I don't find the town itself as nice as Fitzroy, but find that the county around Halls Creek has much more to offer than that around Fitzroy. Tourists stop here to join tours into or stock up for their trip into Purnululu/the Bungle Bungle National Park. There are also some very nice waterholes and places to camp near Halls Creek along the Duncan Road. Kununurra (population around 6000) is the second main tourist hub in the Kimberley. It's located on the eastern edge of the Kimberley, not far from the border between Western Australia and the Northern Territory. 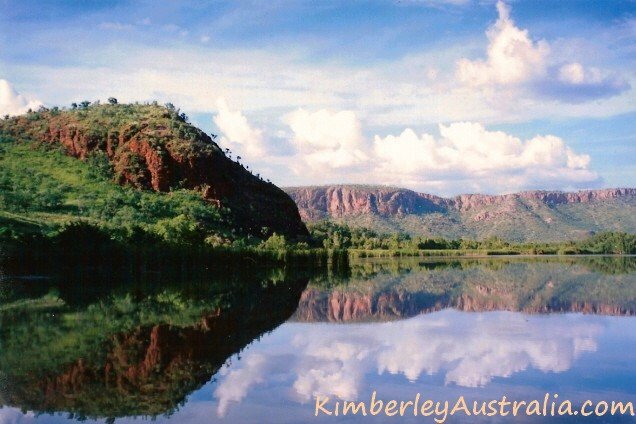 The name Kununurra means "Meeting of The Big Waters" and is very appropriate. The area offers countless gorges and waterfalls, several big tidal rivers, dozens of smaller streams and creeks, Lake Kununurra, and of course the huge expanse of Lake Argyle. 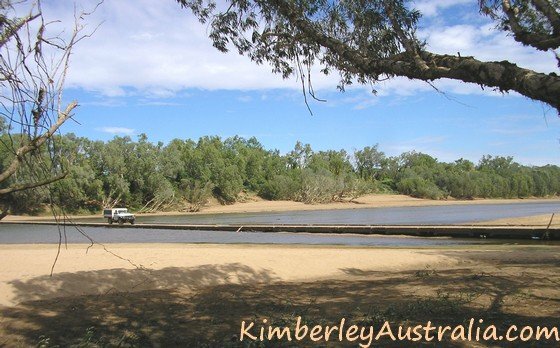 The town and the surrounding farmlands are surprisingly lush and productive thanks to the massive Ord River irrigation scheme, and the whole east Kimberley is by far the most scenic part of the north west. 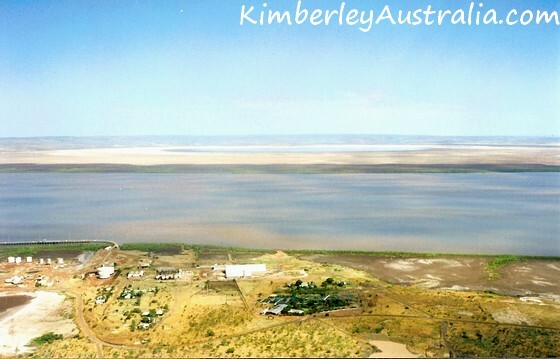 Wyndham is the Kimberley's oldest and and also its northernmost town. Wyndham is located on the coast, 100 km north of Kununurra. However, like Derby it sits on the edge of a gulf and has no beaches. Just crocodiles, tidal flats and mangrove swamps. There isn't much there, except for a lot of history. The town has been shrinking and shrinking for many years. I still think Wyndham is well worth a visit.